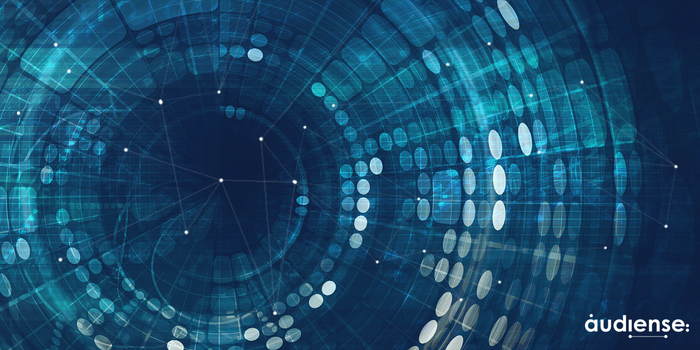 We are continuing our series of articles about the best way to use social data in the competitive intelligence field. With this information and insights the performance of competitors are provided, and help us to discover the strongest companies in the industry. 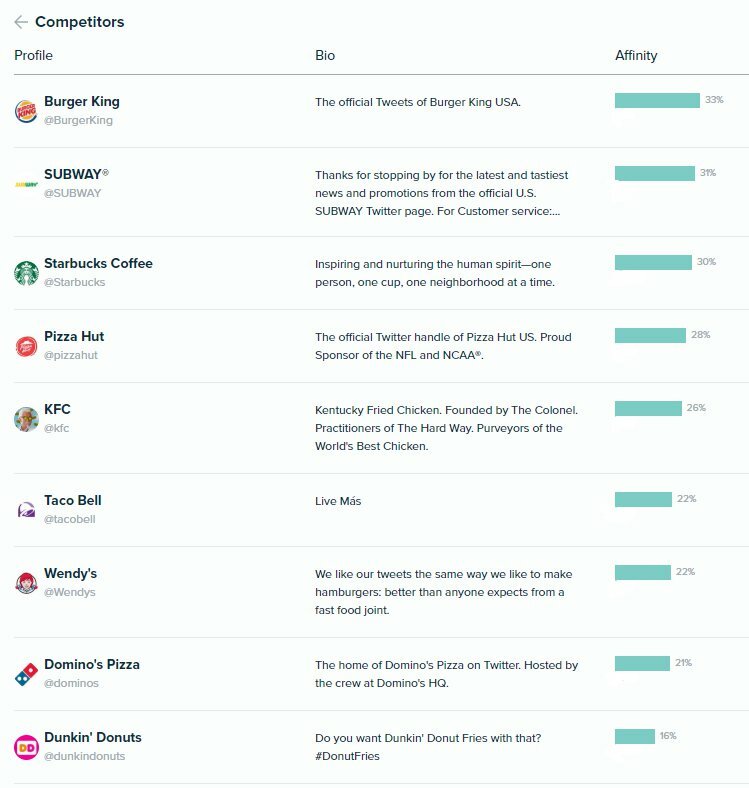 As we are in the midst of the World Cup, we are continuing to explore the possibilities of social data for competitive intelligence analysis, focusing on one of the main sponsors, McDonald's. After using social data to put together a list of competitors, next we can analyze the competition and determine the insights that could to be extracted. A traditional metric that is analyzed in regards to social media is the size of the community. When looking at the trend of how competitors' accounts grow, clues as to what strategies are working for them start to appear. After the data is extracted from social networks it will provide us with valuable insights into strategies and tactics competitors use in their marketing campaigns and activities. When analyzed together all those activities, trends are uncovered and help to influence your marketing strategies. Do you really know how much of your potential audience you are reaching? What’s your markets entire audience? Once the size of your market audience is known, you will be able to determine how much of the market there is for you to conquer. 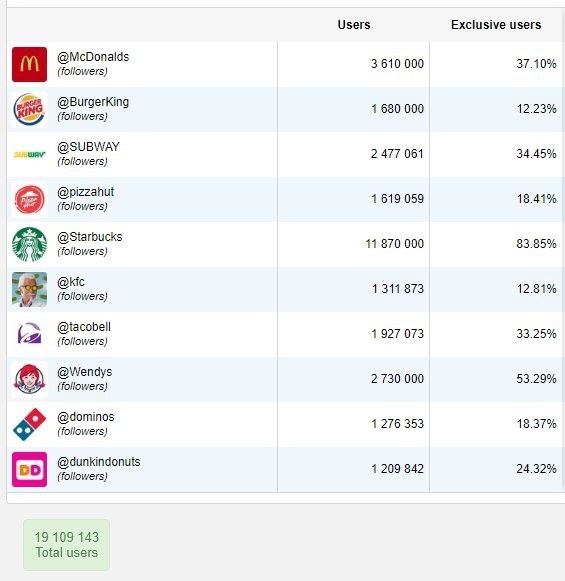 When analyzing McDonald's and their competitors we see that the market is made up of more than 19 million people, but if we are only looking at the exclusive McDonald’s followers we see that they have a shared voice of 37%. This means that there are more than 15 million users that could be targeted during upcoming marketing campaigns because they show an affinity to their competitors. Ask yourself how many members of your audience overlap with the audiences of your competitors? When identifying both the quantity and the identity of the full audience, your competitor’s audience and your audience, it will help to determine different marketing strategies that should be taken into consideration for each segment of the audience. When analyzing the overlap of audiences, using social data, it can help identify the audiences that matter most to your business. It also provides you with an in-depth look into potential target audiences enabling the development of new campaigns and strategies. Social data extracted from the competition’s performance can help define other areas of interest such as new potential audiences to target. Based on these insights, the audiences of interest can be identified and further analyzed. This helps in gaining an in-depth knowledge of different segments in order to inform the marketing strategies directed towards these groups. In our next article we will discuss this issue more in the use of social data for competitive intelligence. So why not give Audiense Insights a try to gain the most accurate and valuable social data knowledge about your competitors' audience? Request your demo today and discover what Audiense can reveal about your competition! ← You have to be in social networks, but what role do they play in marketing strategy?